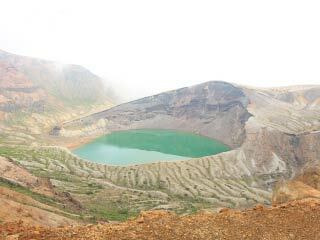 Okama (御釜) is a crater lake located on the top of Mt. Zao. It is the main feature of Mt. Zao. It is also known as Five colors pond because the color of the lake changes by the weather and seasons. Mostly, the color of the lake is a beautiful green. It has very strong acid water lake in the world. Therefore, there is no living organism in this lake. You can walk around the east side of the lake to see from different angle. It is still active volcano, so its water sometimes boils by the ground heat. There is parking, restroom and gift shop. Parking near the lake is 520 yen per car. You can’t go near the lake. 1. at Shiraishi Zao station. 2. use local bus to Okama. You can also come from Yamagata prefecture.